The year was 1614, more than four centuries ago, that the original Onrust was built in New York Bay. According to Dutch archival records, Captain Adriaen Block undertook four voyages to the Northeast between 1611 and 1613 to establish a fur trading network with the Native Americans and to chart the coastal waters and rivers of the region Henry Hudson had surveyed for the Dutch in 1609. While overwintering (1613/1614) in New York Bay, his ship, the Tyger (Tiger), caught fire and burned to the waterline. Working through the frigid winter, Block built a new ship from the salvaged remnants and named it the Onrust, Dutch for “Unrest” or “Restlessness”. It was the first vessel built by Europeans in New York State and the first yacht built in the New World. Onrust’s construction most likely took place under the auspices of shipwright, Herman Hillebrantsen, a member of Block’s crew together with the assistance of Block’s remaining crew members, an estimated 8 sailors. Relying on their knowledge of ship building for their very survival and thanks to peaceful relations with the local Native population, the Onrust was constructed in approximately four months and completed in April of 1614. Based on Dutch records the ship was a “small Yacht of about eight lasts (16 ton burden)” and measured 44 ½ feet in length, with a beam of 11 ½ feet and a keel of 38 feet long. Block’s problems did not end with fire on the Tiger. Some believe he named the ship “Onrust” for the “unrest” that erupted among the crew of the three Dutch ships, the Tyger, the Fortuyn ( Fortune) and the Nachtegael (Nightingale) that had set out to explore the east Coast and had arrived in New York Bay in the fall of 1613. The Fortune and Tiger, both under the command of Block, were owned by the Amsterdam Van Tweenhuysen Company, while the Nightingale under the command of captain Mossel, was sailing for the rival Claesz Company. After disagreements on each ship’s share in the trade, the disgruntled half of Block’s Tyger crew mutinied and even threatened to put the Onrust, still under construction, on fire. In the end the mutineers confiscated the Nightingale, became pirates and left for the Caribbean. Eventually the Nightingale changed course and ended up in Ireland, a hotbed for pirates at the time. ​Despite the episode of unrest in 1614, Block completed his intended mission. The same year, Block established the first fur trading post, Fort Nassau, at the current site of Albany, which formed the basis for the first permanent European settlement in the Hudson Valley. Hendrick Christiansen, captain of the Fortune, had been put in charge of building the fort on Castle Island, the present-day site of the port of Albany. The records indicate that the Onrust visited Fort Nassau in 1614 while the fort was still under construction. He and his associates are credited with mapping the coastal areas from Cape Cod to the Delaware Bay, including the major rivers and locations of more than twenty significant Native American villages. Once the Onrust was launched, coastal explorations continued, starting out in Upper New York Bay. Block sailed through the perilous passageway in the East River, which he named “Hellegat”(Hell's Gate), and explored the harbors and rivers of Long Island and Connecticut, locating the Housatonic and Thames Rivers, and sailed up the Connecticut River all the way past the site of present-day Hartford. From there the Onrust sailed on to Narragansett and Buzzard Bays to Cape Cod. Before returning to the Dutch Republic, Block left the Onrust in charge of Captain Cornelius Hendrickson, who during the next years explored the New Jersey coast and Delaware River region. Their voyages laid the basis for the future Dutch claim to the newly surveyed territory. On his 1614 map, Block named the region “New Netherland”, an area extending from Pennsylvania into current New England, and named Block Island after himself. The area comprised parts of the states of New York, Connecticut, New Jersey, Delaware and Pennsylvania, all lands situated between 40 and 45 degrees latitude. 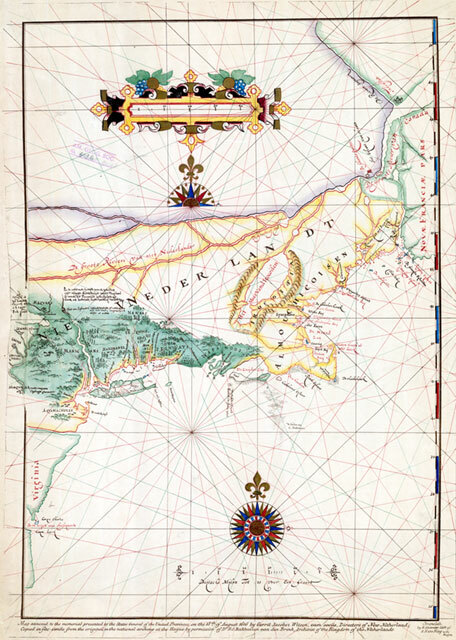 Both Block and Hendrickson are credited with the first detailed maps of the Northeast. Although the ship's historic accounts end with Hendrickson's 1616 expedition and no-one knows the final disposition of the ship, one historian has theorized that the Onrust might have crossed the ocean possibly under a different name.